Sometimes our dinner consists of a healthy salad with a sandwich. This is one such salad we prepared last week. It is full of deliciousness and health. We just mix and match ingredients. Try it and you will definitely like it. Just mix them all in a bowl. Sprinkle black pepper. Add desired sauce on top. Toss to coat well. Let it rest for 30 minutes and enjoy. That’s all! So simple and yummy. I have been eating varieties of salads these days. I will add this too to my menu. so colorful and filling salad looks great uma. looking so colorful n yummy salad for sure..
really super salad dearie.. looks so inviting with lovely colors and combo..
Looks like Ceasar salad Uma,simply superb yaa! Colourful salad looks superb uma! 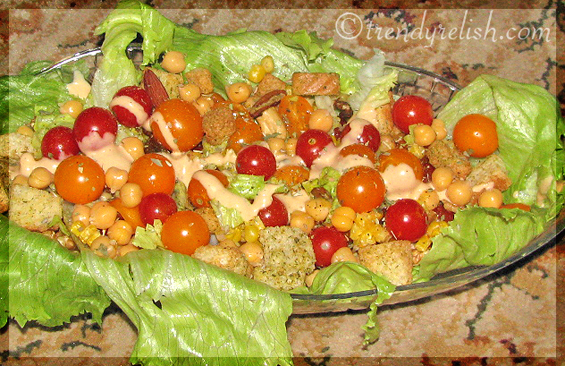 looks great, Uma...very healthy too..I would love to try Thousand Island dressing. Looks nice ,its really a super salad..Nice , healthy combinations. First of all.., the new blog header is good. Now coming to the salad, I have been eagarly looking for healthy salad recipes. Thanks for sharing. I will try to prepare this. Very colourful and quick to make salad. Wow that is a delcious clourfull looking salade. Colorful and healthy salad. More the color more the nutrients, lovely. Looks really colourfl, and the croutons must make it crunchy as well! What a stunning array of colours and nutrients. Do check Dubai Palm islands tour in my World food treat blog..! Thats really so colour Uma, though I am not such a salad person, am sure I won't say to such colourful treat! Wow so colorful and delicious! 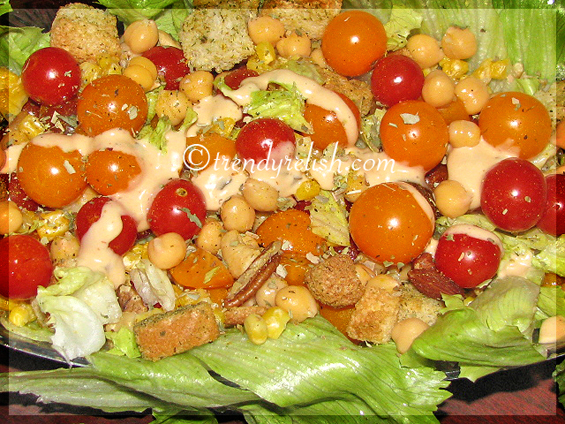 Healthy & Delicious salad.Do visit my blog when u find time. Looks colourful and nutritious !